The Fiction Editor is a little gem about editing novels by a fellow named Thomas McCormack. It’s probably the best book on editing fiction I’ve ever read, and I’ve read plenty. Most books on writing you’re lucky if you pick up one good tip. I’m serious about that. In one book I learned to be careful with the verb “To be” (it’s better to say “the birds flew” than “the birds were flying”). In another book I learned that the maxim “show don’t tell” is not a one size fits all piece of advice (sometimes it’s better to sum up crucial facts quickly than add a chapter to your manuscript). In yet another I learned to use a single name for your characters (don’t keep changing the name from Fred to the red haired youth to the budding gymnast back to Fred again) and in another I learned that tension does not exist in the manuscript but rather in the reader, and is generated by constantly posing questions that must be answered. In McCormack’s text, although not quite one-stop shopping, I garnered many such tips. McCormack is a former editor for St. Martin’s Press. In fact, he ran the joint for many years, and in so doing turned its fortunes around (it was on its deathbed when he inherited it). But he was always a budding writer (dramatist mainly) and clearly empathised with the writers he worked with, relating strongly to their needs. And what many of them need most is a good editor. McCormack’s main premise in The Fiction Editor is that good editors are few and far between, and this is primarily because editing has always been mostly an intuitive endeavor. Editors have a few tricks up their sleeves but mostly they seem to go by their guts. They might recognize that something doesn’t quite work, but they don’t necessarily know why it doesn’t work, or how to fix it. McCormack argues strongly for a more disciplined, almost scientifically rigorous approach to editing. I’ve always felt myself that there are a million hidden rules in writing, that I’ve gradually been unearthing one by one, almost like panning for gold. I have yearned for a teacher who could lay those rules out one by one, clearly, systematically, a process after which I would know how to write not only clearly and quickly, but well. McCormack goes on to divulge a few tricks of the trade, a mere handful compared to what must be out there, but far more than in most books. I suggest you purchase the book (now in an expanded second edition, available at Amazon.com) to find out what they are. One caveat: The Fiction Editor is slightly self-indulgent. McCormack was the most powerful man in his company (I suspect) when he wrote it; it could have benefited from at least one more pass (hence the second edition… I own the first). I wonder if his underlings were afraid to point out a few things. For instance, he loves to make up words (neologisms, for which he apologizes). Actually, I quite like many of his neologisms, such as “gad factor” (the extent to which characters conflict). Others (such as “somacluster”) don’t work quite so well (I’ve read the book twice and still can’t quite remember what somacluster is supposed to mean). The worst is “master prelibation,” which is really just an unfortunate and distracting choice of words, and which, were it not for McCormack’s otherwise earnest tone, I might almost suspect is a joke on his part. But I wouldn’t let that exceedingly minor caveat put you off. 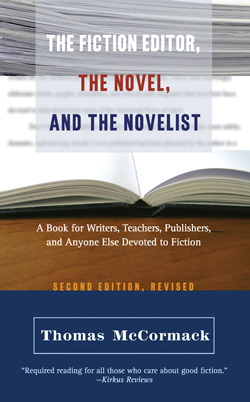 This really is a terrific little book on the art of fiction editing.